The other day it was far from perfect weather but the beauty of the Florida Keys we just come up with a plan. As the wind was over 25 and coming from the east we headed down to 7 mile bridge to fish a channel between some flats and with seas less than 1 foot very easy. The tide was running very fast near 5 mile an hour going south a good direction to draw out a bull shark from the bridge our plan A . Weed on the lines was a problem but after a short time line pulled out of the outrigger clip [ by using the out riggers we have a 38 ft wide boat ] and fish on ! This puppy was pulling hard and wanted nothing to do with the boat hard powerful runs and we did not see it for a long time. 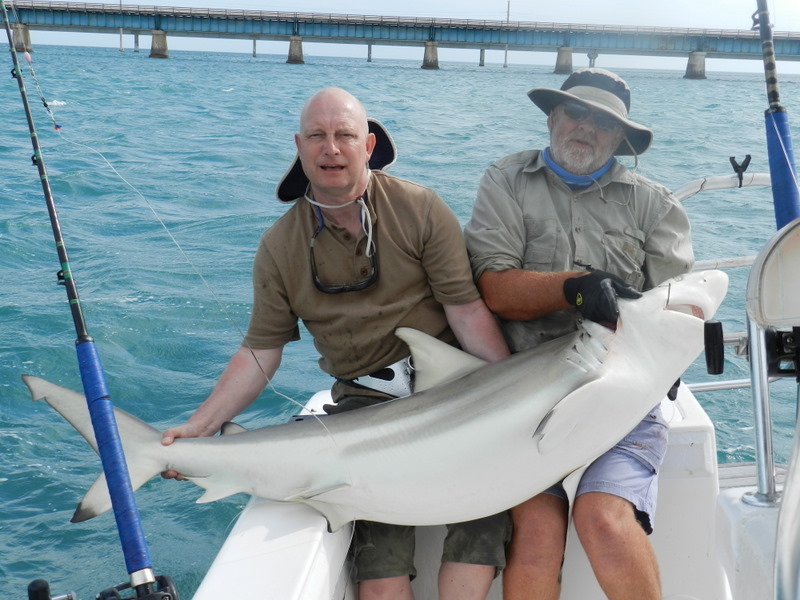 Not the bull we had hope for but BIG blacktip and why do I say ” do you want it in for a pic ” well this was the only blacktip I could not lift on my own. In my life I have lifted to many old bags of cement at the good old 112 lbs and this fish was way over that. 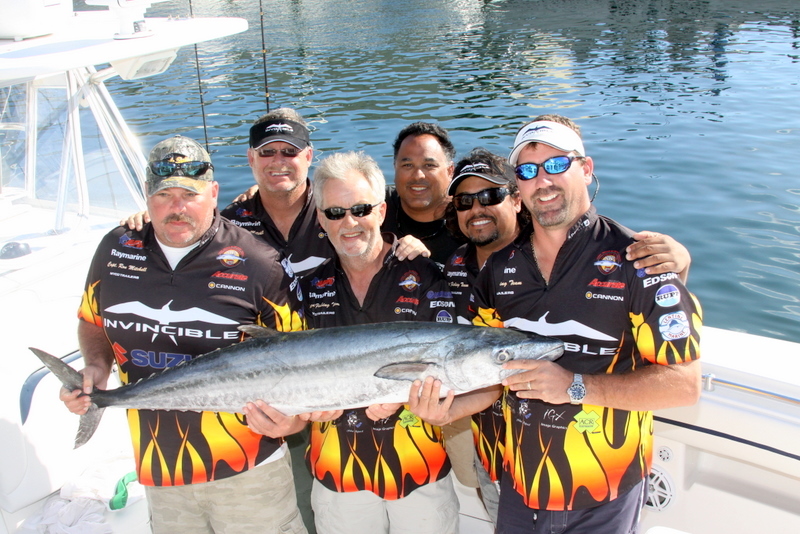 With help from the crew we got in on the gunnels and you can see in the photo trashed angler Steve and trashed skip me. With the Florida record just 152 lb this fish was very near if not over but no way was a beauty of a fish like this being killed so she went back to fight an other day happy days. One of the fish Vic had wanted was a big grouper and he had lost two the other day on the wreck but lady luck gave him an other chance. When it was his turn on the shark a big fish started to take drag but in a nurse shark way but this was going on for a long time. Many nurse near the bridge will go over 200 lb so we were all telling Vic to get on with it and drag the fish in but this one was not for coming in. Then at last I got the leader and to all our surprise a grouper well over 300 lb, in a very strong tide Vic had ticked the box. 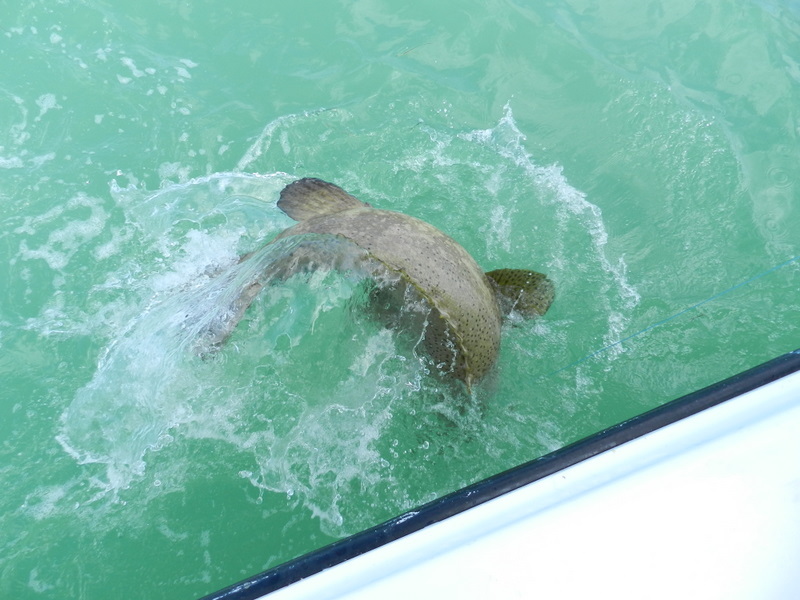 Not a bad first day for newcomers to our fishing holidays in the Florida Keys 18 species with fish to 150 lb. It is so nice to see new people don’t get me wrong I love my regulars but we have to turn away many people they often say why don’t you run two boats ? Well let me assure you one boat is more than enough one local made me laugh the other day as we were both buying yet more boat parts. You know the true meaning of B.O.A.T it is not break out another thousand it is bend over and take it how true. Back to yesterday as I said it was Vic and his two friends first day so a learning day in the bay which was calm. In my opinion it was a bit quite and we had to go to plan B as a boat was on my plan A wreck but what we did find was Pompano. These little brothers of the permit pull so hard way above their weight and on light tackle so much fun. Best of all and I am not ashamed to say it they taste fantastic and just one was put in the ice box. Last year they changed the regs on pompano and permit and we are all waiting to see if it makes a change. The problem is that they both look very similar and the bag limit has been cut form six to just one in a special zone . If only people would just leave the spawning grounds if there are to many sharks there to see fish after fish nailed on the way back is just crazy. 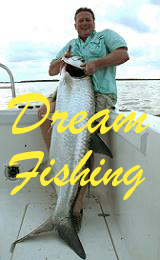 We at Fish the Dream have had over the years our fair share of luck and tears with the tunas. Best I think was a bigeye tuna of over 30 lbs on 20 lb spinning gear it went like stink and we ate well for days. In fact of the 108 species of fish we have had over the 8 years of running fishing holidays 6 are tuna. We have not had yet a yellowfin or bluefin back to the boat but more than once we have been spooled on the tuna grounds and I think these two might have been the culprits. To be on the tuna grounds in the Florida Keys at sunrise is a very and I mean very special thing. From no where the birds arrive then the tuna start to crash the bait and the frigate birds pick the bait out of the air mind blowing. The fight even from a small tuna will leave you amazed the poor guy in the photo does not have a dry square inch of that shirt but the smile says it all. 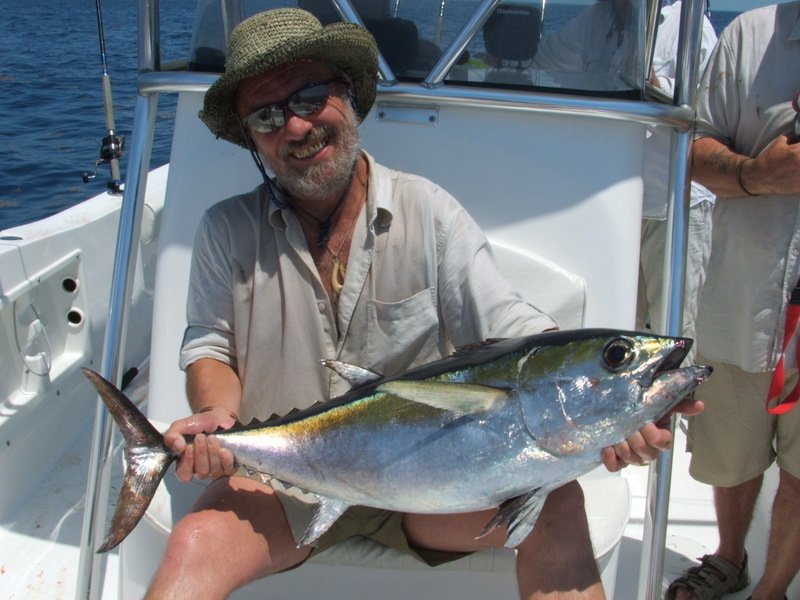 The main reason I started this blog about tuna was a numbing fact in a recent fishing mag here in the Florida Keys. At a recent sale at Tokyo’s fish market a single tuna made nearly $400,000 a new record. That works out at $533 a pound and that is the wholesale price. The problem with this insanity it turns the commercial fishermen into bounty hunters. Some thing has to be done world wide to help the bluefin because with these rewards the bluefin will be fished out in a very short time and the pressure will go to the other tunas. Well all good things have to come to an end and it seems when you are on a fishing holiday that seems very true. Despite sad faces the plans for the last day were made over one of Helens famous Florida fries and with light winds offshore in search of king mackerel was the A plan. On getting to the Atlantic not quite as we hoped the SE winds a bit stronger than we had hoped and a very confused sea running against the tide giving 2s to 3s that were going to get worse. So after a quick discussion back deep into the bay still after kings but on a wreck some 20 miles into the Gulf. Back in the bay a different world less than 1 ft seas and flat calm in areas strange but true a trip of only 4 miles such a contrast. After a run of some 40 mins hearts sunk again a boat on the wreck plan B dead but the joys of the Florida Keys plan C quickly formed. 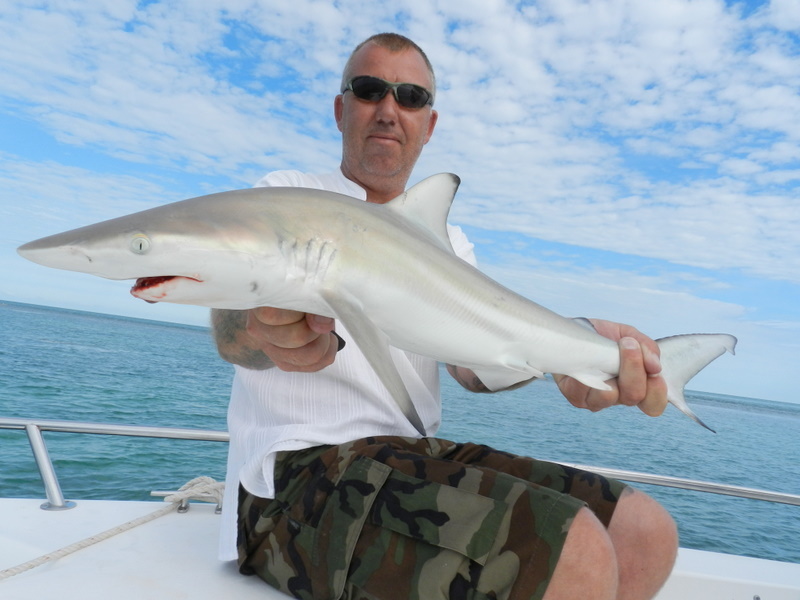 The one fish that really ticked the box for Paul is what we call the sporty shark. Shark in the teens to 30 lbs that run jump and freely take the bait and dont hide under rocks. So when I told Paul we were only 2 miles from a very good shark mark plan C was on. Within mineutes of getting there it was fish on, and fish on hetic or what. In fact this was going to end up as a day Paul and Carol would remember for a very long time. The tide gods were good as well and we had a perfect tide for nearly all day running away from the stern. Also just enough fresh mackerel to keep the baits going in fact more than once we had shark on the light mackerel jig rods fun or what. 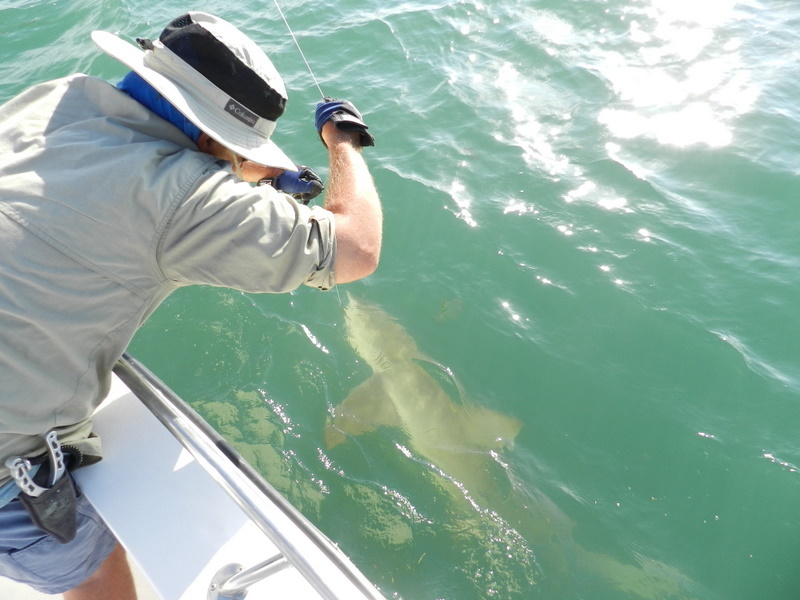 Biggest shark was a nurse about 150 lb a big lump but very powerful and a pain at the boat. 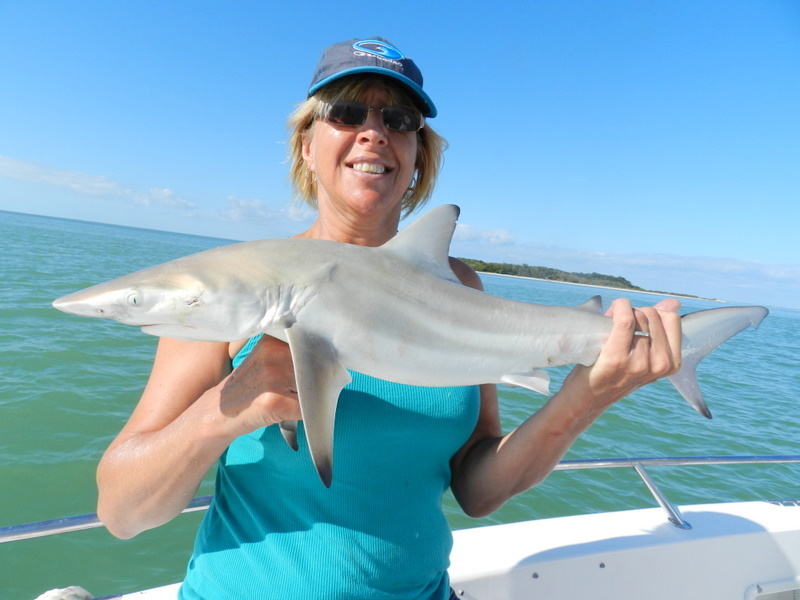 Best with out a doubt was a blacktip near 100 lb that Carol had on the lightest shark rod. To say she did well is an understatement after over half an hour she had the fish at the boat but with a very light leader it was always going to get off. I touched the leader and fish gone. We ended up with 53 yes 53 shark to the boat and just two anglers a record that I think will stand for a very long time well done and as always a joy to fish with you guys. 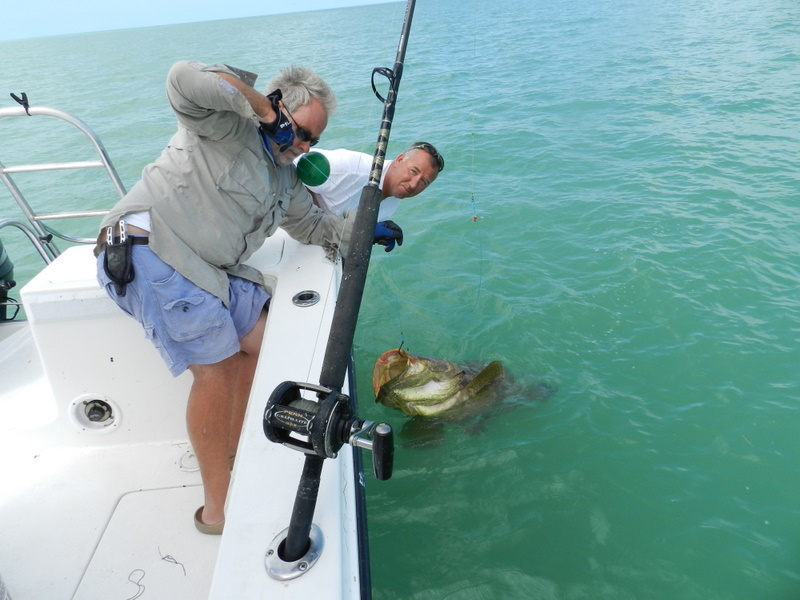 As you know all our customers on fishing holidays in the Florida Keys call the shots so when Paul said at breakfast that he had not caught a big grouper it was game on. I am very sorry but after doing fishing holidays now for over 8 years it is very hard to remember what people have had on their previous trips. So off to my favorite wreck we went quick stop for fresh bait on the way and with some good mackerel in the box we arrived. Not the best tide and after the cold front sea temps were about 10 degrees down but on the first run back the big balloon dipped but came back up. With the big circle hooks we use 22/o the bait has to go well down in the mouth. Same thing on the next run interest but no take but on the third run a proper take locked drag and FISH ON ! 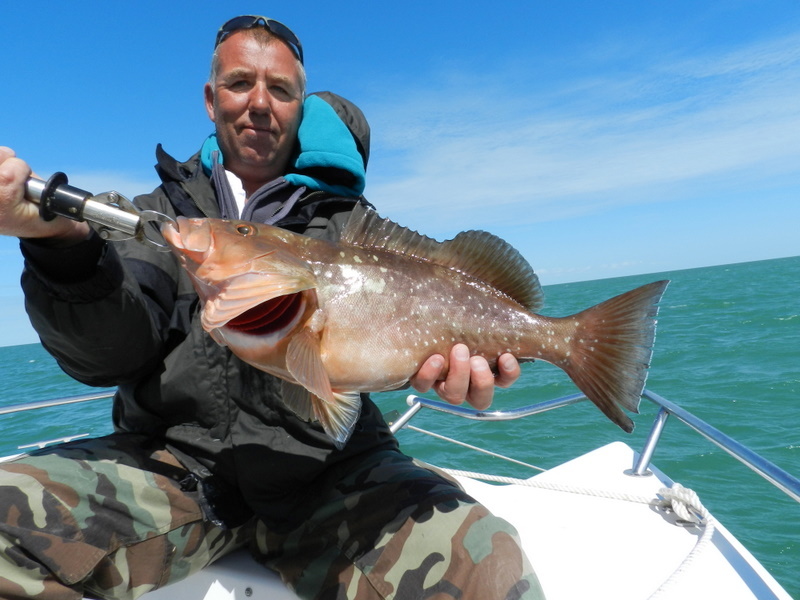 You only have a few seconds to make or break a grouper and with the Whippy Walk you must drag the fish back out of the wreck or it is game over. Well Paul did just fine and with the fish out of the wreck time to enjoy the power of these fish most guests just shake their heads. This for us was not a very big fish but at over 150 lb I think I ticked the box Paul and Carol seemed very happy. The rest of the day the tide just died Carol ended up having a blast on jacks and we moved to get Carol her shark for the day. The very big one did not come so me thinks they will just have to come back again skips plan or what ? The last two days have been tough with the cold front dropping sea temps down 10 degrees and winds to over 25 not ideal fishing conditions. Many years ago an American guide said to me screw this I hate not catching that day we must have moved over 20 times and yes we found the fish and yes we started catching. 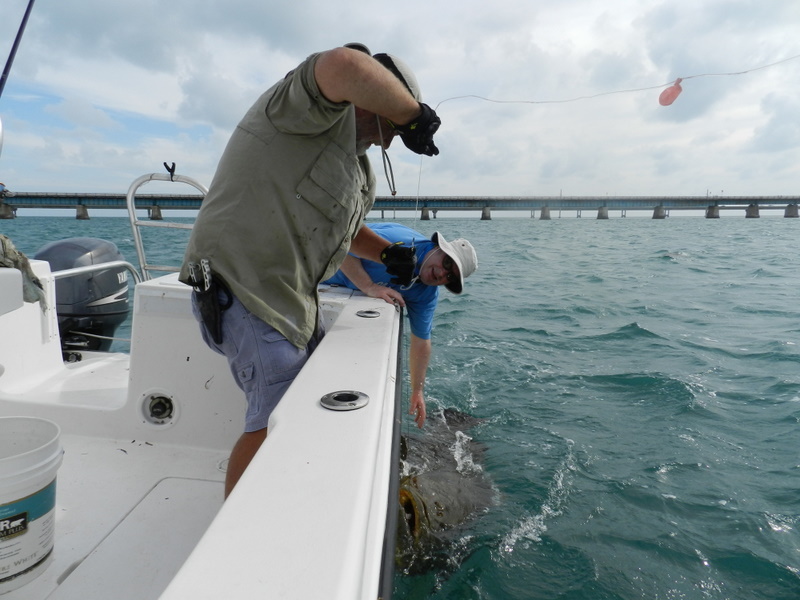 This is the beauty of the Florida Keys we move a lot because we can from the flats to the channels to the banks to the bridges and more. I think if people are on a fishing holiday it is up to me to work my but off to find them fish and yesterday I did just that. Not a stellar day but we found grouper, ladyfish, mackerel, snapper,bluefish and more, Carol had a shark to keep up the every day we have had a shark thing. As they say it will get better and today we are back to normal temps and as I do this blog the winds have died so plans are being made to go for a big goliath grouper and cobia. 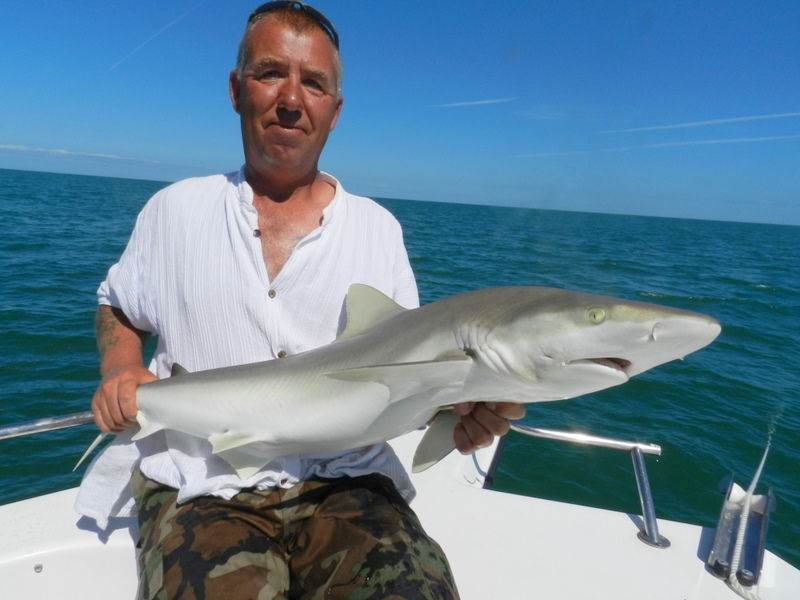 One of Pauls favorite fish in the Florida Keys are the small shark we now call these sporty shark and on light gear so much fun. They do the lot, take freely run and jump and the fights are over quickly so you can carry on and best of all you are not beat up at the end. So yesterday we had to make a weather call first thing and with a cold front coming in a low temp of 18 just for one day back into the mid 20s in two days the winds were going to pick up. First thing it was blowing less than ten but we went on the side of caution and stayed close seeking the shelter of a bank just 5 miles out all the other boats were heading north to the distant wrecks as now is cobia time. Well by lunch we had made the right call and the blow was well over 20 gusting to 30 but behind our bank waves were only may be 1 to 2 ft so very comfortable and all the other boats were coming back. Well we had a lot of fish but to Pauls delight the chum and oil brought in the sporty shark and we went down to light tackle and we had a ball. The only problem with sporty shark fishing is that occasionally a big boy comes in a crashes the party. Well this happened yesterday and late in the afternoon a big well over 100 lb shark hit Carols rod and as she was running out of line we had to leave the ankor and follow. With just a 25lb leader it was going to be fun but Carol was up for it so game on. This big boy had one big trick to play why do this in nice sheltered water so of over the bank he went first taking the boat in water less than 3 ft then into the big 4 to 6 ft seas on the windward side of the bank. Carol as always did a fantastic job and despite the seas twice we had the leader by the boat but in the end we were broke off but what a battle in rough seas. Now were did I put my jeans and sweatshirt ? As I have said before ever since a young 22 year old Miss Ballantine took the salmon record with a 64 lb fish in 1922 we guys have had to suffer. No to be honest some women just get it right and Carol is right up there at the top Paul should be very proud and yesterday was no exception. We had to find shelter as is was blowing 15 + and behind a bank some 16 miles out . This bank cut the waves down to just 1 to 2 ft and was the pefect speed to get the kite up on of my favorite way to fish. So chum down and soon the bait fish then as normal the macs arrived not as thick as they have been we are having a very warm winter and with water temps at 73 a bit warm for are winter fish. 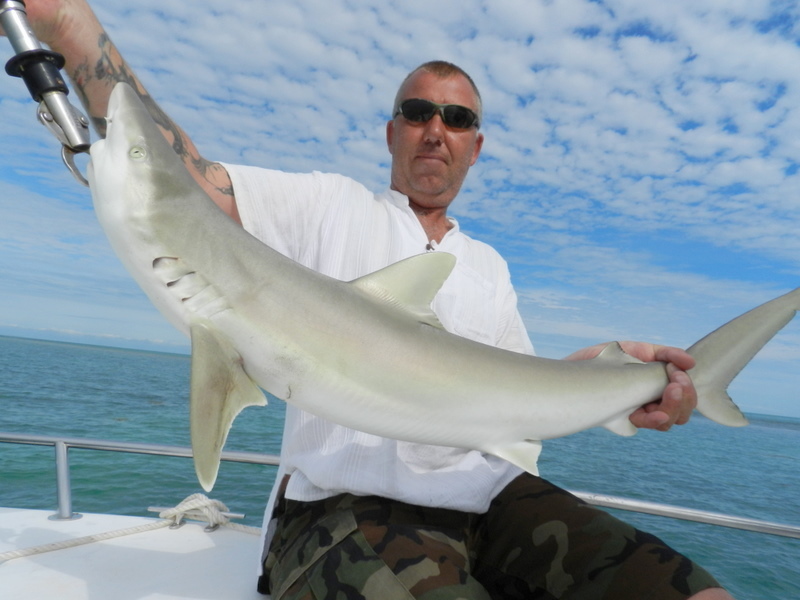 These fish are top shark bait but on the right size tackle more fun than anyone should have. 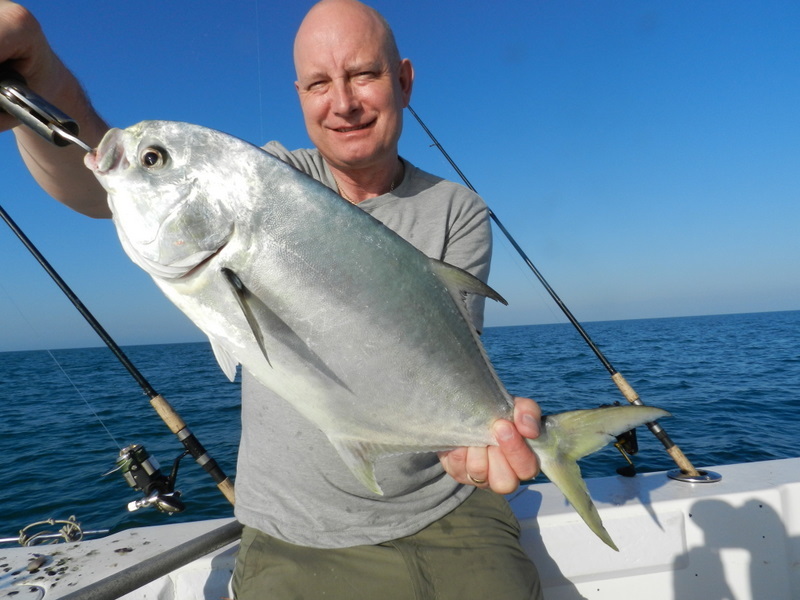 I totally agree with Henry Gilbey once you lose the joy of catching small fish you are missing a big part of fishing and our macs bring smile after smile. With good bait in the bait box out went the shark rod and with a blue runner on out went the kite rod. 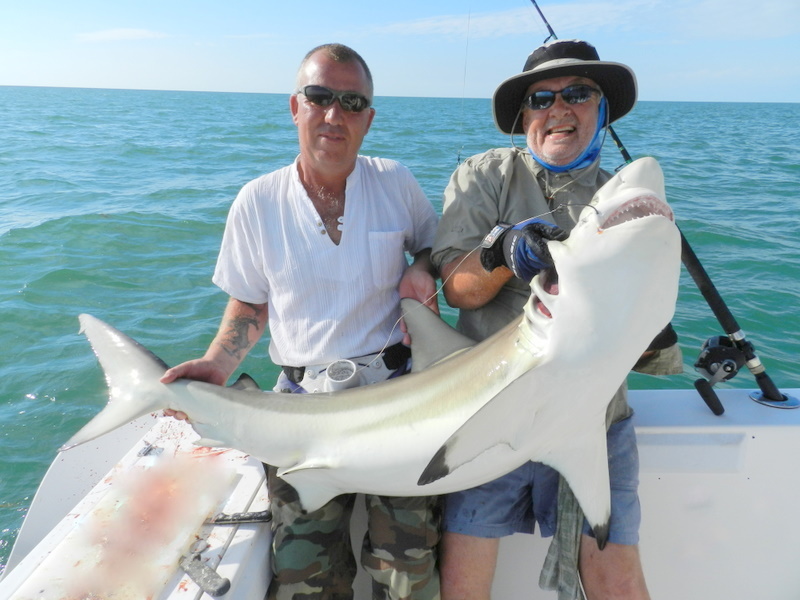 Both rods were quieter than normal as well but the shark we took were top class black fin up to near 90 lbs. Lots of jumps and long hard runs and as is the blackfins trade mark a pain in the a*** at the boat but at least they calm down for a quick pic. The kite was flying as far away as it could from the chum we had on hit but after some time it broke Paul and then it went very quite. As is with the kite we forgot about it then all hell broke out bent double and drag screaming big style. Carol picked up the rod but there was nothing she could do and she was running out of line. So with the run over 300 yds we had to throw the ankor and follow the fish a very very big fish. On just 25 lb main line and a 60 lb leader it was going to be a long fight and the girl did well. 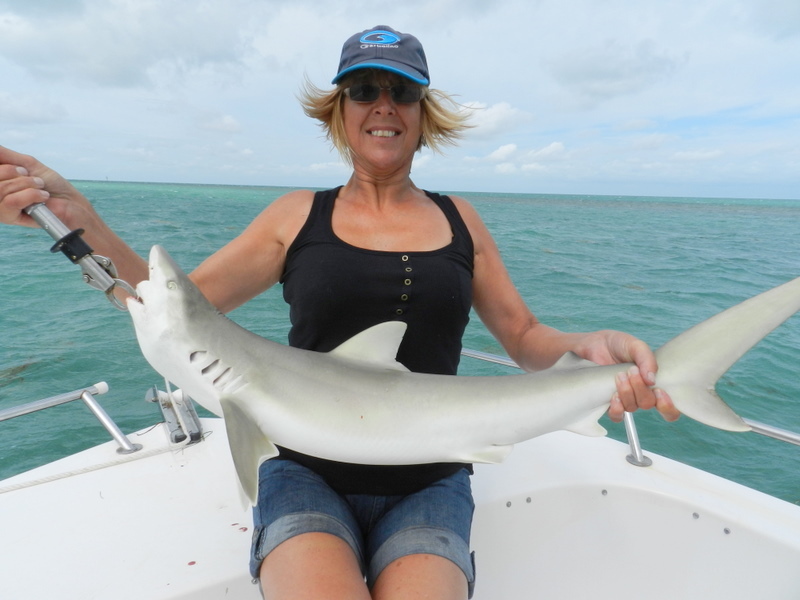 After half an hour of stunning fishing Carol fish by the boat lemon shark well over 200 lbs top marks. Just an other stunning day fishing in the Florida Keys. Sorry with all that’s been going on I have forgotten to give you the results for the SKA round that I fished at Key West. Well not bad at all for Snowbees boat Bandit out of 76 boats we finished 11 th but more important to Capt Ron Mitchell we finished 8 th in Florida division 10. This event does not feature on the Angler of the year championship as it is the first event of the year it lets Captains do all their testing. I had one of my nicest emails every Capt Ron was very happy with my fishing and I now have an open invite to fish with Team Bandit whenever I want WOW. It was such a day of brain overload to much to take in for one old guy. Looking back its the whole event that leaves the impression as I have said before if a beer company was to do a fishing comp it would be a round of the SKA. The boats just blew me away that shotgun start when 76 boats fired up awesome. The fishing just did my head in how can captains target one fish and catch so many big ones. One of the nicest footnotes is all the fish after the weigh in are sold at the local fish market and every dollar is given to local and just local charities. Last year alone on the SKA fishing tour over 1 million dollars was given away to local charities over the south of the US. Please keep a check on Snowbees Team Bandit and how Capt Ron gets on during 2012 at www.fishska.comthey even have live webcasts. 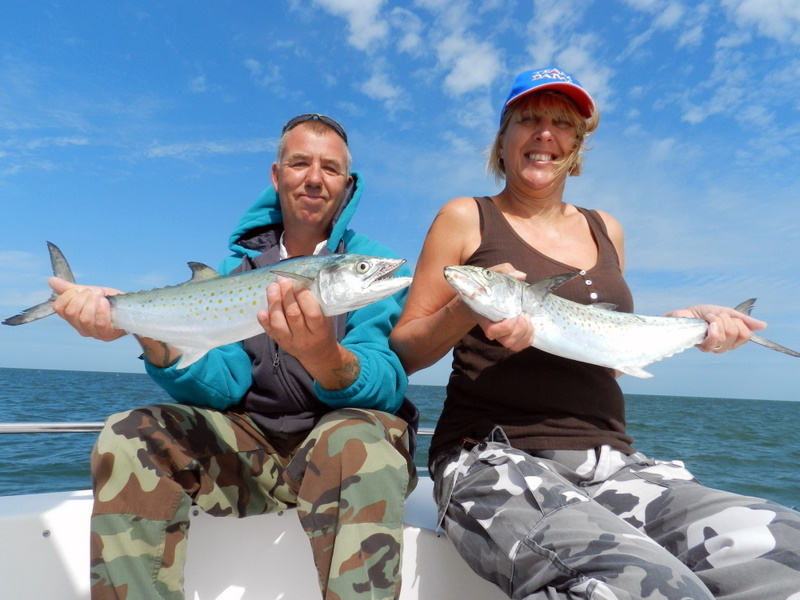 Meanwhile after a major service its back to normal at Fish the Dream doing what I try to do best, fishing holidays in the Florida Keys regulars Paul and Carol come to day. Carol proves the point very well, ladies make very good fisher folk think about it guys go on bring the other half you might be surprised and the weather is good. 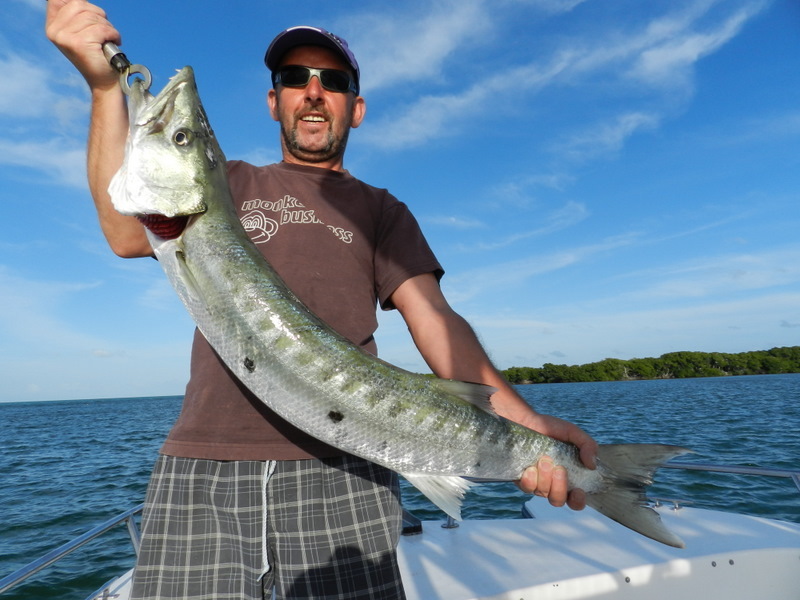 What a cracking day yesterday only one angler the others had wife things to do so Joe asked could we just work lures near the banks for barracuda and anything else. 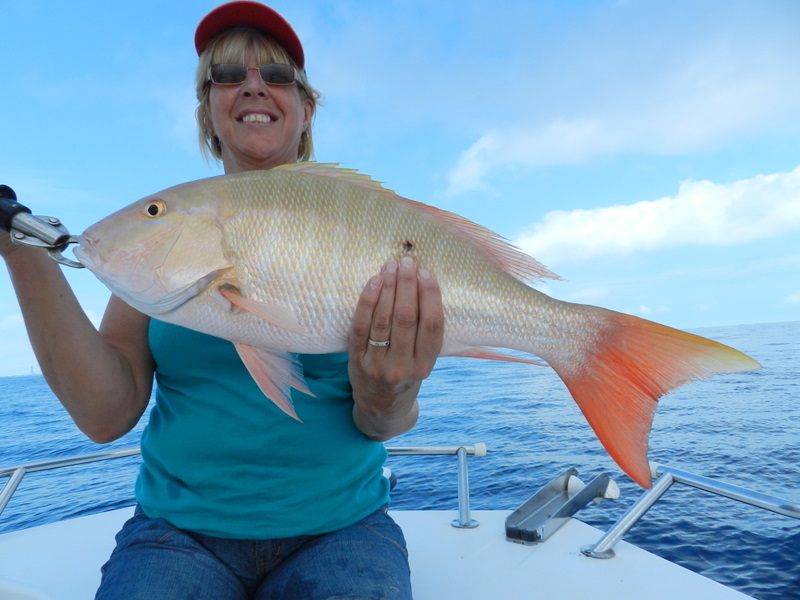 This I think is why we at Fish the Dream have been so successfull with are fishing holidays in the Florida Keys it is the customer who calls the shots. You can fish for what you want, when you want and for as long as you want not some guide who has to be back at 4 pm. Back to yesterday despite blowing 20 mph + we found tons of shelter behind the banks most are 4 to five miles out in the bay but all take the waves right of the sea. We kept on the move on the lee side and found fish on every bank. 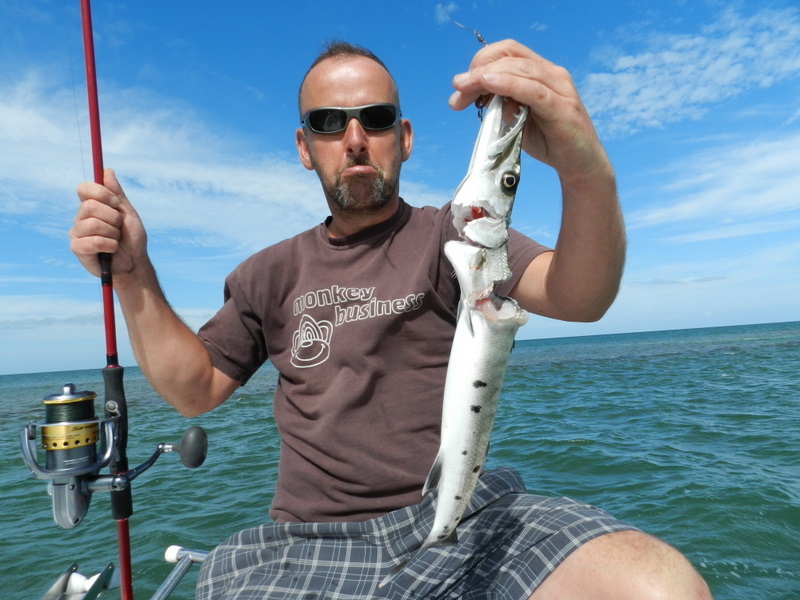 The jacks were insane not very big up to 5 lb but the sight of a shoal surfing to kill the poppers mind blowing. The cuda were there as well in big numbers we lost count but it must have been over 5o for the day best 15 lb so much fun on light spinning rods. 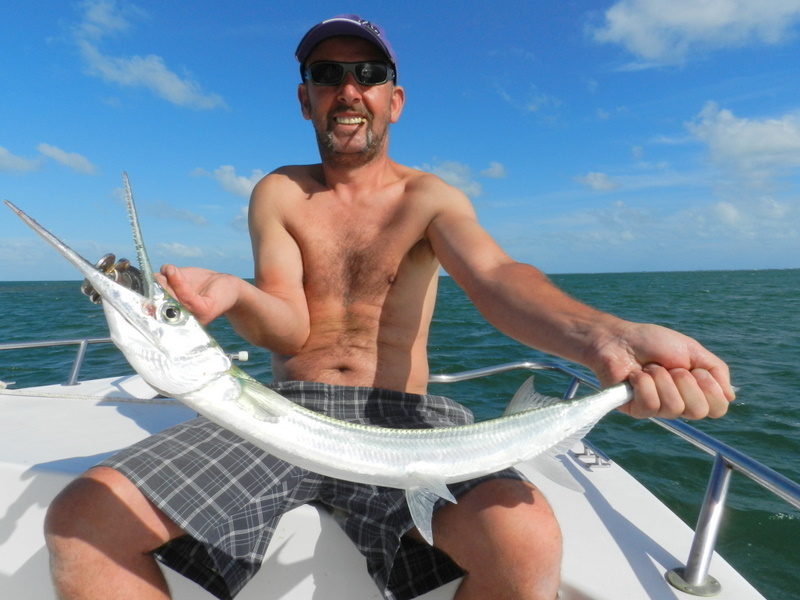 A huge 4 to 5 ft fish nailed one of Joe’s small cuda on the way in a small fish very quickly became a big fish shame it did not stay on maybe a thirty. 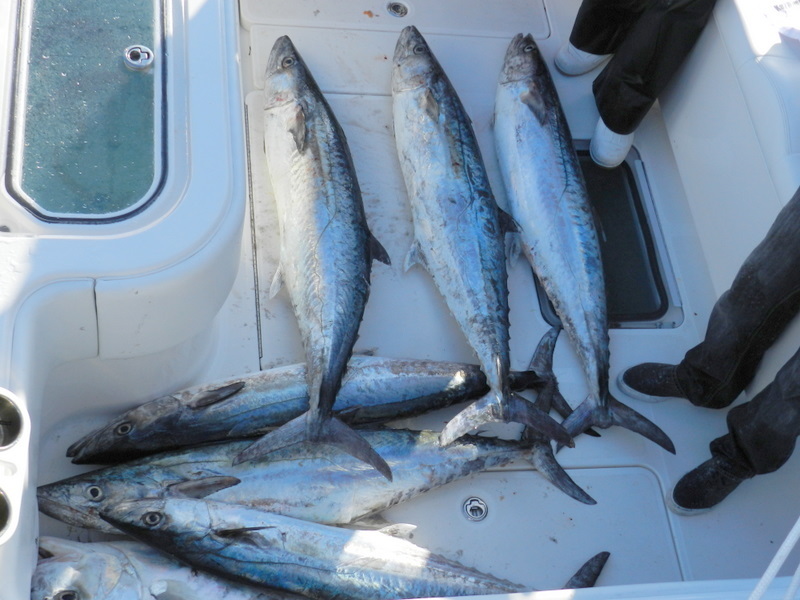 Along with the cuda and jacks we also had blue runners, houndfish, lizard fish, and spanish mackerel. The hound fish are a very big gar and can top 5 ft but still have the green bones but eat well. At lunch we put out a small live cuda to see if the big one was still around but this was taken by a 100 lb + nurse shark shame. Back to the dock with a very tired Joe but a day he will rember.